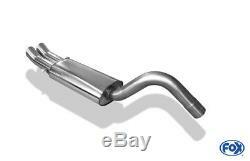 Audi 80/90 type 89 sedan cabriolet sport muffler coupe 2x76 mm dtm optics. This product page has been automatically translated. If you have any questions, do not hesitate to contact us. Audi 80/90 - type 89, b3 - sedan / coupé + cabrio b4 sports silencer - type of 2 x 76 18 per fox. Including mounting hardware - our exhaust outlets are all bright silver, they are polished by hand to a high gloss. 1.6 l 51 / 55kw 1.8 l 65/66/82/85/92 / 103kw 2.0 l 82/83/85 / 103kw 2.0 l 16v 101 / 103kw 2.3 l 98/100 / 123kw 2.6 110kw 2.8 ll 128kw 1.6 ld 40kw 1.6 l td 59kw 1.9 l td 50 / 66kw. Systems only as a complete chat system with au011000-msd, au011000 vsd and au011000 vb1 / vb2 and vb3! Made individually, it can lead to delivery from 3 to 15 business days! Fox exhaust represents 100% quality for each vehicle is unique and produces for you sportauspuffanlagen at the highest level. Quality-oriented processing of all high quality stainless steel components. Sporty and its excellent fit. The development of optimized performance of all silencers, specially tailored to the individual needs of each type of training. Certificate ce / abe for all current models. Flexible exhaust pipe design according to the customer. On heavily polished nozzles designed. Important note fox silencers are, unless otherwise stated, be mounted on the front muffler / center standard. Fox front or central silencer matched not in combination with the original silencer! In the order process, you can combine multiple auctions from us and save on shipping, customize your billing and shipping address and choose the payment method and delivery method. All information about the payment as on our account data, and intended to be used in case of payment prepayment / bank transfer as well. Exhaust vents and universal parts. 1 month revocation or return. Satisfied or refunded - if the item not received or not as described (protection of the buyer). Installation of your articles on request. Your opinion is important to us! Please do not hesitate to contact us if you need help or have any questions. Is all to your satisfaction, we would be very grateful to you for a positive review! Biocin maintenance spray for cats and dogs spray g ..
universal battery charger with discharge function u .. 4 x original bmw tire bag / tires bag / bag .. 2 x ac / dc power supply universal 1000ma 230v / 50hz .. bmw e46 320/323/325/328/330 spare tube for ..
bmw e63 / 64 4.4 l 245kw and 4.8 l 270kw spare tube .. smart fortwo coupe 451 brabus bumper sp .. toyota yaris xp9 ts 1.8 98kw pipe connection z l .. Glänzend silber, sie sind per hand auf hochglanz poliert. 100% "made in germany" - seit 20 jahren! 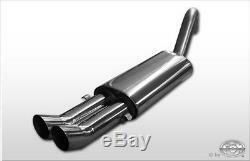 The item "audi 80/90 type 89 sedan cabriolet muffler sport 2x76 mm dtm optics" is on sale since Friday, October 6, 2017. 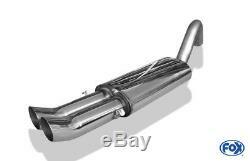 It is in the category "auto, motorcycle parts, accessories \ tuning, styling \ exhausts \ muffler ". The seller is "bonze24_de" and is located in dortmund. This item can be shipped to the following country: european union. fox is for: 100% "Made in Germany" - for 20 years!